German does do that a lot. I heard that's why they lost the war. That, and the practice of putting verbs at the end of sentences, so you have to wait to see what you're being ordered to do. But then I dropped out of German, so what do I know. Give it time, Dan, just giveitime. 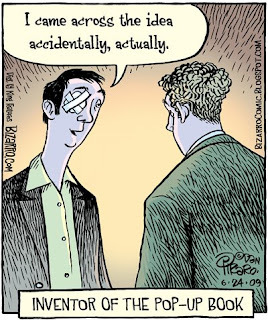 Wondering if this is the same unfortunate character, with an eye injury, whose mother kept her career as a sword swallower, while she was pregnant with him (earlier Bizarro cartoon). Tragically, for him, it looks like a similar injury. We don't do that in English, so fuggetaboutit.